The threat of biological weapons has never attracted as much public attention as in the past five years. Current concerns largely relate to the threat of weapons acquisition and use by rogue states or by terrorists. But the threat has deeper roots—it has been evident for fifty years that biological agents could be used to cause mass casualties and large-scale economic damage. Yet there has been little historical analysis of such weapons over the past half-century. 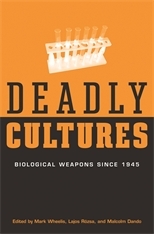 Deadly Cultures sets out to fill this gap by analyzing the historical developments since 1945 and addressing three central issues: Why have states continued or begun programs for acquiring biological weapons? Why have states terminated biological weapons programs? How have states demonstrated that they have truly terminated their biological weapons programs? We now live in a world in which the basic knowledge needed to develop biological weapons is more widely available than ever before. Deadly Cultures provides the lessons from history that we urgently need in order to strengthen the long-standing prohibition of biological weapons.